This huge char was caught on a fly by Craig Blackie (holding rod). It weighed over 24 lbs and is estimated to be the largest fly-caught char on record. The blazing beast was released seconds after this photo was taken. 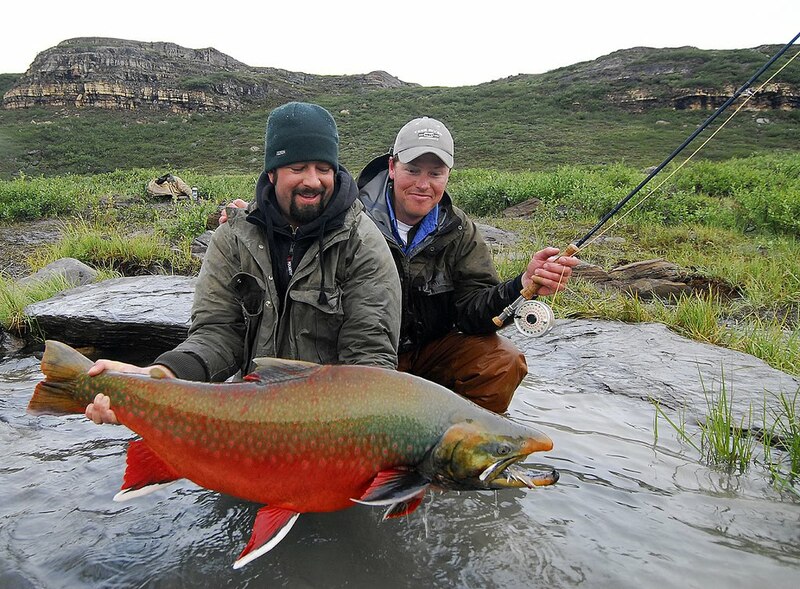 Both guys in the shot are fish biologists and they specialize in salmonid morphology and taxonomy. Visit Paul Vecsei's Photostream to view other amazing fish including giant lake trout, backcrossed carp, strange chubs and more. As you'll discover, fisheries biology has it's perks. Spectacular! Well done, and thanks for sharing. I think my life would be complete if I were you. Nice fish man! Well, I need posting lessons it seems. Anyway, that is one amazing char you have there. I hope you don't mind, I've put up a link on my own blog for the guys I fish with down here in the Southern Blue Ridge. We have a strain of native Southern App. Brook Trout you might be interested in catching. Of course, it would take about 400 of them to equal the size of this one, incredible fish! Good work...and nice photograph, too! That fish is scary beautiful. Way to go. WOW!.. awesome fish!. Great blog too, keep up the god work. Holy whopper char batman! Good thing I am in the process of becoming a fisheries biologist. It looks like tremendous things await!